After checking out best selling homebrewing equipment on Amazon, I thought I would share with you the list. I was surprised how many Mr Beer related items were in the top 5, however I can see how it makes sense. If someone is just looking to try out homebrewing, a Mr Beer kit isn’t a bad way to check it out. Of course, I’d recommend a full size starter kit (like #5) so that you can start brewing extract recipes that’ll lead to better tasting beer. I’m not ashamed to say that my first homemade beer was with a Mr Beer kit. It was a great stepping stone into the world of homebrewing. These are plastic bottles, but if you’re looking for more bottles to store beer, I would check out some made of glass. Includes the makings for Vienna Lager, Canadian Draft, and Weizenbier. Another solid kit from Mr Beer to check out if you want to dip your toe into homebrewing. Now, this is what I’m talking about! 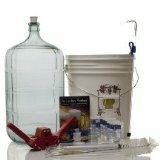 If you’re looking to get into some serious homebrewing, I would check out this kit. It has pretty much everything that you would need to brew your first batch of extract beer. Make sure to stay tuned with Passion For The Pint via Facebook and Twitter for more homebrewing info. Previous article Fresh Brews: Cooking with Beer, Beer In History And A Whole Lot More!